It takes time to find your way through depression or anxiety, so JK will take you through the skills you need one at a time. There have been some changes to The Journal, make sure you check out the FAQs. You’ll learn each skill in a short lesson and then you will work through a task to build practical changes into your life. Most people do the online learning in about 20 minutes then practise the skills over one week, but you can take as long as you like. You’ll also get email and text reminders for each lesson and practical task you need to do. If you need any help the helpline 0800 111 757 is available 24/7. 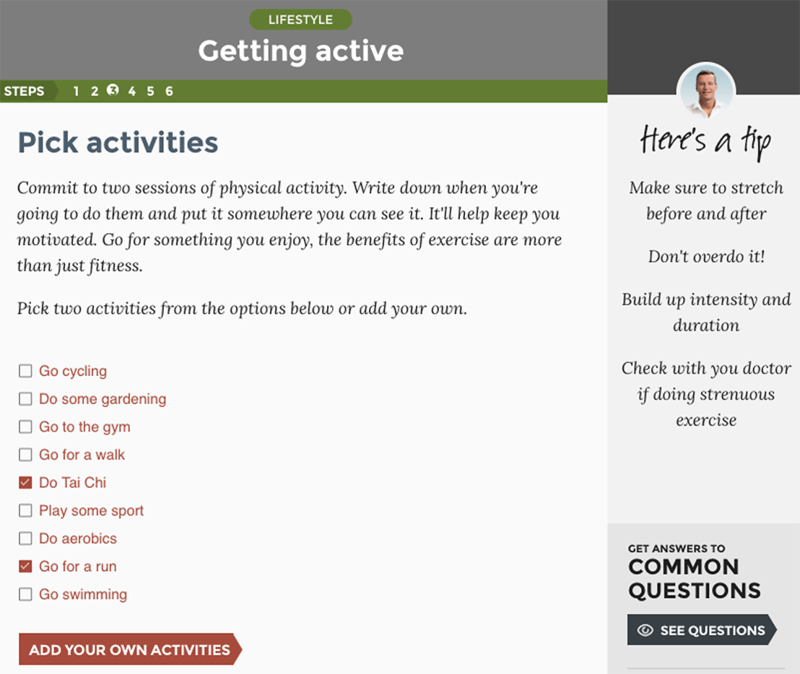 The Journal starts by taking the self-test. The self-test is a good tool to help you identify if you’re experiencing the signs we associate with depression and when to get professional help that’s right for you. In your results you'll see a link to start The Journal. Your score from the test will be transferred to The Journal, so you can see changes over time. If you’re concerned about your self-test results call the helpline on 0800 111 757 for more information or visit your doctor. Who can The Journal help? Anyone can do this programme and benefit from it. It has been designed mainly for people experiencing mild to moderate depression or anxiety but it might also be helpful for those who have more severe conditions. If you’re experiencing more severe depression and need more support from a mental health professional please contact your local services for more information. The programme teaches skills more suited to people over the age of 16 years-old. For young people needing support with their mental health visit The Lowdown, the information on this website is specifically designed for young people. How do I support someone else doing The Journal? You might even be able to help them practise what they learn - they will have some practical tasks to complete. If you’re concerned about anything they’re doing during the programme you can contact the helpline on 0800 111 757. The helpline can be reached free via phone, email and text to provide support and assistance with any issues you have with The Journal. The team can also follow up on the support they provide and you can arrange a time for them to get in touch with you. This support is only available within Aotearoa New Zealand and users overseas should seek help from their health care provider or emergency services in their country. The website will collect a small amount of information like your contact information and the tasks and issues you enter into The Journal during the programme. This will help create your personal journal and send you reminders for your tasks. This information is held on secure systems. Data may be used in a non-identifying way (anonymous) to monitor the use and the quality of the programme and for reporting purposes. The helpline team is available to help you throughout the programme and you can discuss your journal activity during support calls, but this is entirely your choice. What information is collected or used? Any collected personal information is protected from modification, misuse, disclosure, loss and unauthorised access. Phone numbers and email addresses gathered by the helpline team will not be used for any promotional reasons. Please contact the helpline if you would like to access a copy of your personal information or believe that the information they have about you is not recent, complete or accurate. Every service user has the right to request the correction of any information which relates to you and is inaccurate and is entitled to a copy of the information. How is The Journal evaluated? From time to time we evaluate how The Journal is used and how useful it is. Doing this helps us make sure we have a high quality programme. To do this we randomly select a group of people who have used The Journal and inviting them, via email, to be interviewed about their experience. If you are contacted, but would prefer not to complete an interview, this will not affect your access to The Journal in any way. 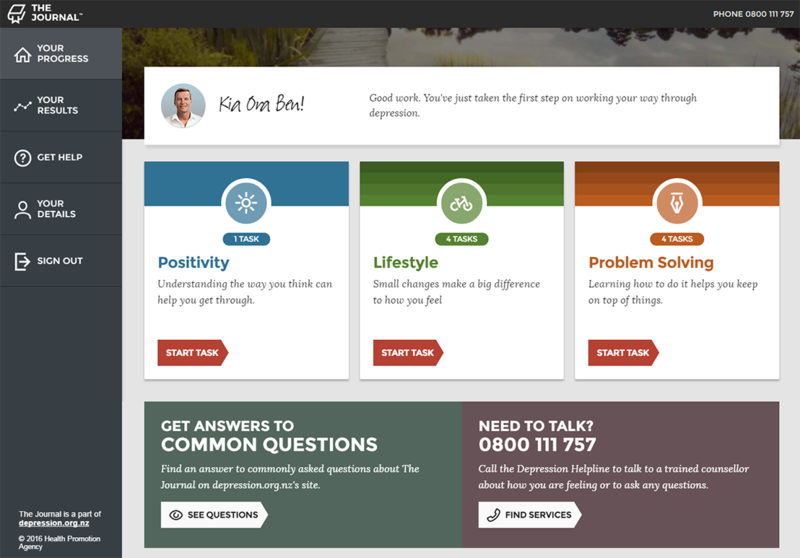 The Journal is designed to teach you skills to help you get through depression. It's where we'll go and have lessons and record our progress. First up, you can access The Journal on almost any device. And it's really easy to use. I'll guide you through, with a team of mental health experts. We'll take you through lessons... "So dealing with problems seems to be part of everyday life, but Lyndy, one thing I've never really understood, is it the problems that cause the depression or the depression that cause the problems?" "That's a really good question John and the two get really muddled up. And how you think about problems really changes when you get depressed". And set you tasks to help you improve the way you feel. "Ok, Your task is to identify a problem of your own to work on". You can make a plan to get through. And you can track your progress to see how you're doing. I promise you'll get a lot out of it, and if you need a hand the help line is available 24/7. So sign-up today and lets get into it.